Whether it’s time-consuming shaving, messy hair removal creams, or painful waxing, your current hair removal method may be getting tiresome pretty fast. At Plateroti Dermatology in Templeton, California, Lumenis® Lightsheer® Desire™ laser hair removal permanently reduces your unwanted hair growth to save you time, frustration, and money long term. Use the online booking tool or call Carmelo Plateroti, DO, FAOCD, FAAD, and the team at Plateroti Dermatology to schedule your appointment today. Why is laser hair removal a better choice? Shaving, depilatory creams, and waxing are all very temporary solutions for hair removal. All of these methods get rid of hair on your body, but they do nothing for the hair below the surface, inside the follicle. Laser hair removal offers a far more lasting solution because it targets the follicle, where the hair growth starts. The laser injures the follicle to keep it from making new hair, something that no other hair removal method does. The Lumenis® Lightsheer® Desire™ system is proven to have results lasting for up to a decade. Talk to your Plateroti Dermatology care provider about your hair removal needs. If you have embarrassing or intrusive hair, Lumenis Lightsheer Desire can help. The ideal candidate for laser hair removal with the Lumenis Lightsheer Desire system is a patient with dark and coarse hair. The darker and coarser the hair, the more pigment that the laser can target, which means the most successful removal. Lighter hair, particularly blonde hair, is more difficult to target due to lack of pigment, and white hair isn't removable because it doesn't have any pigment. However, most shades of hair can be removed. 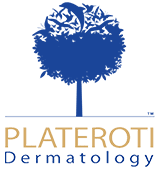 Talk to your Plateroti Dermatology care provider about your candidacy and your needs so you can plan the optimal treatment. The Lumenis Lightsheer Desire has special vacuum technology that gently pulls your skin up before it treats the hair follicle. This combines with the ChillTip™ cooling system to make the treatment so comfortable that you don't need numbing cream. Most patients find the treatment easily tolerated. How long does it take to clear my unwanted hair? Most patients get desired results after multiple sessions. Generally, your Plateroti Dermatology care provider recommends five sessions for the best results. Although you may have some regrowth in the future, any regrowth is usually much thinner and lighter in color than your previous hair. Schedule your laser hair removal consultation using the online tool or by calling the Plateroti Dermatology office today.